Recently refurbished modern restaurant, situated in the Moat House Hotel, offering a variety of styles, from carvery to a la carte menu featuring modern European cuisine. An extensive wine list with wines from all over the world and a separate and relaxing bar area. Perfect venue for 2-150 guests. 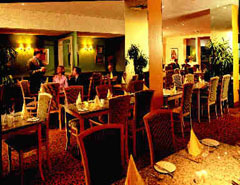 A variety of cuisine styles from carvery to a la carte.